Did you know where your favorite cheese came from? 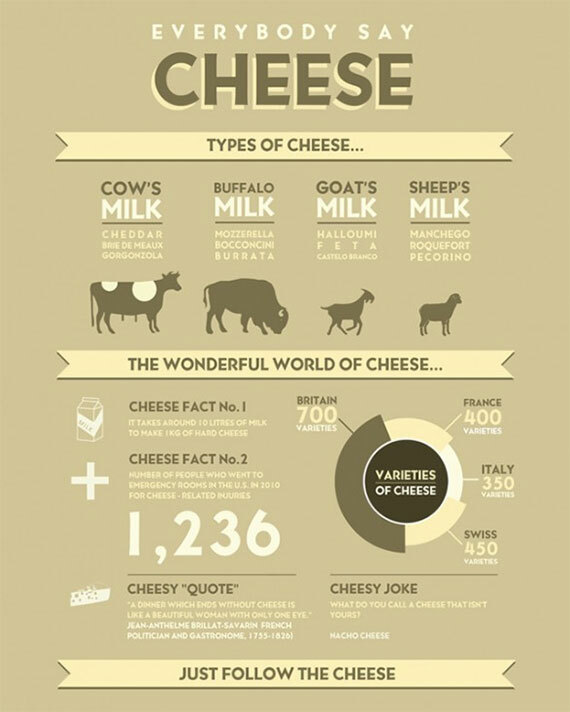 We loved this infographic about cheese and where different cheese varieties are derived from, from the site, visual.ly. Unless we are lactose intolerant, we all love one or the other variety of cheese. Some of the best cheese producing countries include Spain, Italy and of course France. Most food chefs swear by Parmigiano Reggiano cheese, which is a saltier cheese with a granular texture, often shredded or shaved over food. Mozzerella is one of the most popular fresh cheeses finding it’s way in everyday meal. What are some of your favorite cheeses? Cheeses are often served as appetizers or condiments or garnish to main dishes. However, an array of dishes are cooked with cheeses too, giving them a rich and comforting flavor. Browse RecipeBridge with Cheese recipes to cook tonight!